I have been working with Ashaway MonoGut strings for some time and have really good results but, until now, nothing yet definitive in terms of durability for “heavy users”. Two examples are from different sides of the age spectrum but both are aggressive tournament level hitters. Example one is a fifteen (15) year old girl using a 104 square inch racquet with a 18×20 string pattern with the entire string bed in MonoGut ZX. Without going into a lot of detail the string is lasting over six (6) weeks and exhibits about 40% notching in the hitting area. Six (6) weeks is a long time at this level however the string bed stiffness has degraded by over 20% and she was noticing the difference. My recommendation for her is to re-string at least every four (4) weeks. Example two is a thirty-five (35) year old ex college player using a 98 square inch racquet with a 18×20 pattern. The setup for this player is MonoGut ZX in the main string and Babolat VS Team in the cross strings. This is the most durable hybrid for his game and the addition of “string savers” in areas that exhibit wear keeps this setup going for a long time. Being a PEEK material the additional benefit is the absence of polyester. 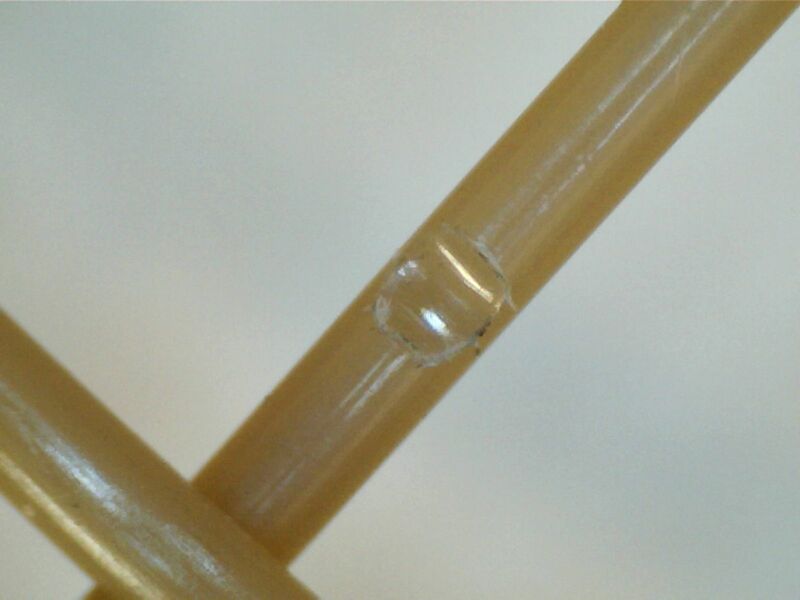 The PEEK material creates the low dynamic stiffness which is very easy on the “body”. Because Monogut ZX is a “mono” filament it may be confused with a polyester based string. The picture shows the notching created by movement of the string, that, by the way, contributes to “spin”. Ashaway MonoGut ZX is also available in red. Ashaway MonoGut ZX is a fairly expensive string but the performance advantages are worth considering. Posted on May 11, 2013, in Good News!, String. Bookmark the permalink. Leave a comment.